Thank you Long Beach Memorial Medical Center for being a gracious supporter and host of ECLB! ITEP’s newest program, Exploring Careers in Long Beach (ECLB) completed its first year at Cabrillo High School – Go Jaguars! 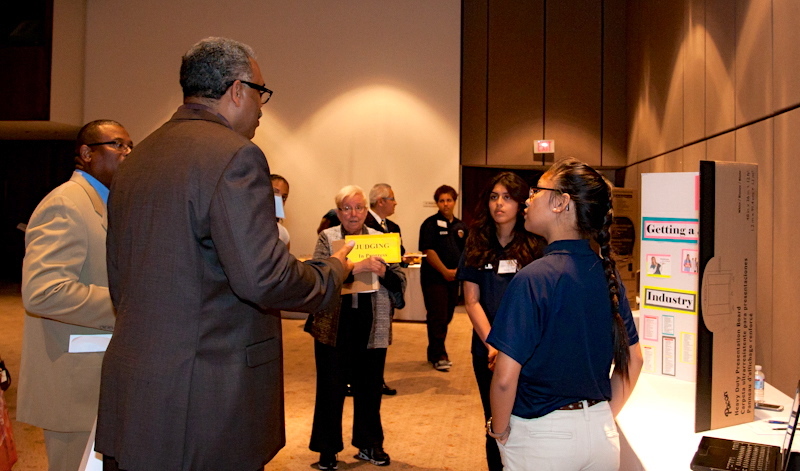 On June 7th, fourteen ECLB students joined by parents, ECLB advisory board members and ITEP staff came together at Long Beach Memorial Medical Center to participate in a celebration and competition. It was a culmination like no other, thanks to program sponsors like APM Terminals, Tesoro, Bandai Foundation, and so many others. In preparation for the event, ECLB sophomores split up into six groups to showcase the knowledge acquired during their time in the program. Each group represented one of the following industries: education, environmental science, global shipping, healthcare, innovation and entrepreneurship, and transportation. Event Chair, Jesse Urquidi of P2S Engineering checks out the Environmental Science exhibit designed by ECLB students. 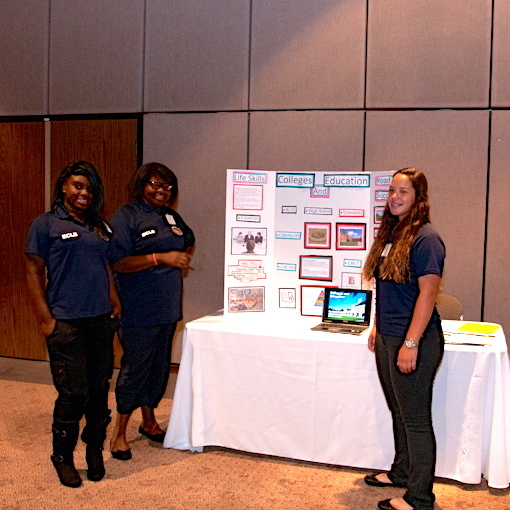 Students prepared presentations and designed table-top exhibits; and in the middle of the prep work – printing, cutting, gluing, practicing speeches, not a single navy blue, ECLB polo was left without a tug of the collar. ECLB “grads” were nervous, but ready. During the first hour of the culmination, industry judges from visited each student group table to select the best project based on industry knowledge, life skills learned and career opportunities within the industry. We were fortunate In the end, there was only one winner – the Innovation and Entrepreneurship team. 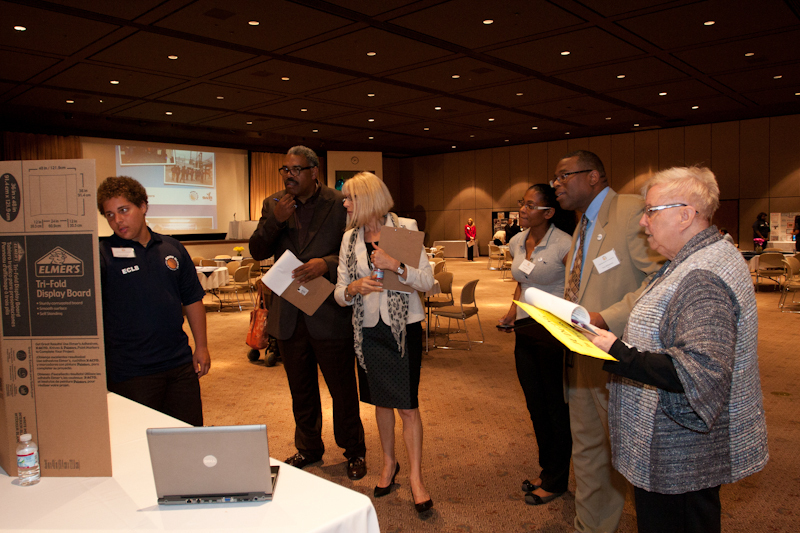 ECLB Culmination judges (Darick Simpson, Long Beach Community Action Partnership; Marianne Venieris, CITT/CSULB; Sharifa Batts, Ports America; Tony Williamson, TTSI; Bonnie Bair, ITEP) visit the Transportation exhibit to hear a student presentation. Judges visit the ECLB Healthcare exhibit. Big congratulations to Bottreychip, Brenda, Jeth and Valentino for their hard work. 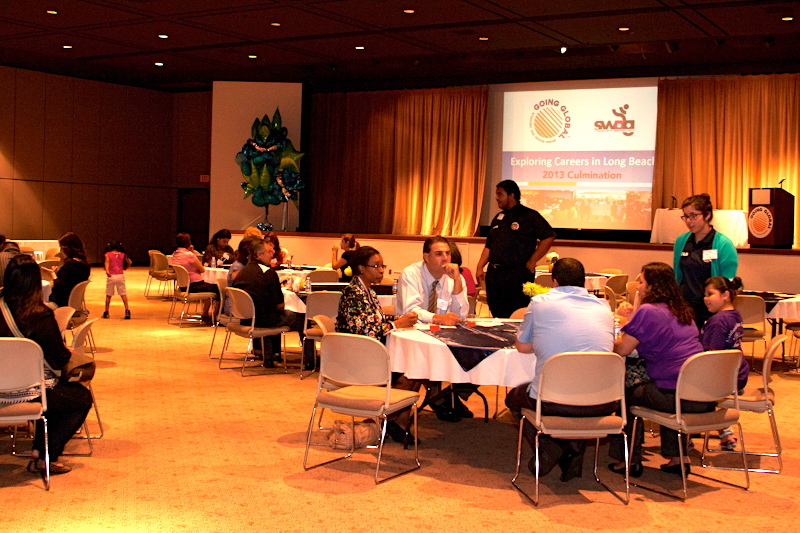 Each winning team member received bragging rights and a $100 cash prize. Could we have a future Steve Jobs in the midst? The winning ECLB team, Innovation & Entrepreneurship, show off their Benjamins. Far left: Amy Grat, ITEP. Far right: Stacey Jones, CH2M Hill; Matt Brown, Cabrillo High School. Then there were the parents, who mingled with industry partners and cheered their sophomores on – they would see their children cross the stage twice during their time as high school parents. All students received the first official ECLB certificates of completion. In addition, four special awards were presented to Cabrillo High over-achievers. We’re looking at you, Ivan, Naima and Valentino! 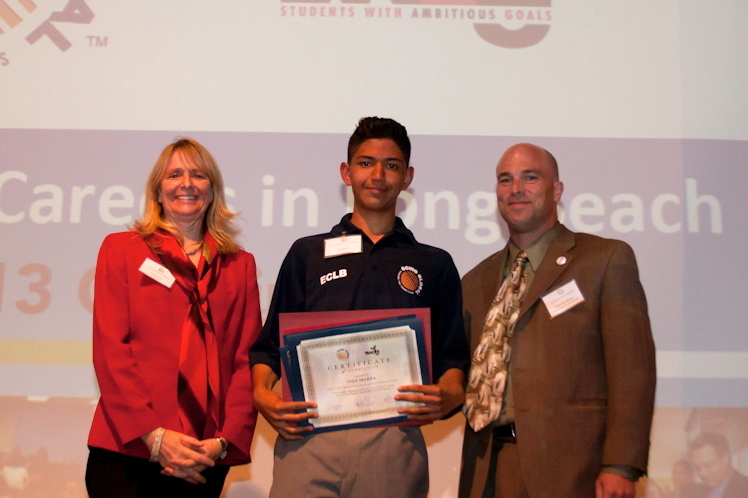 Ivan Ibarra, ECLB Student, receives a Workshop Perfect Attendance Award. Three other students also received special recognition awards. So what’s next for ECLB? All first-year ECLB students will move into the second phase of the program that will involve welcoming and mentoring new ECLB students – these juniors will be the new ITEP ambassadors! A successful night marked the beginning of a new chapter for ECLB and we welcome all who wish to be part of the next ECLB journey. Join our ECLB Advisory Board, host a future workshop or make a donation. Want to be involved in another way? Let us know. 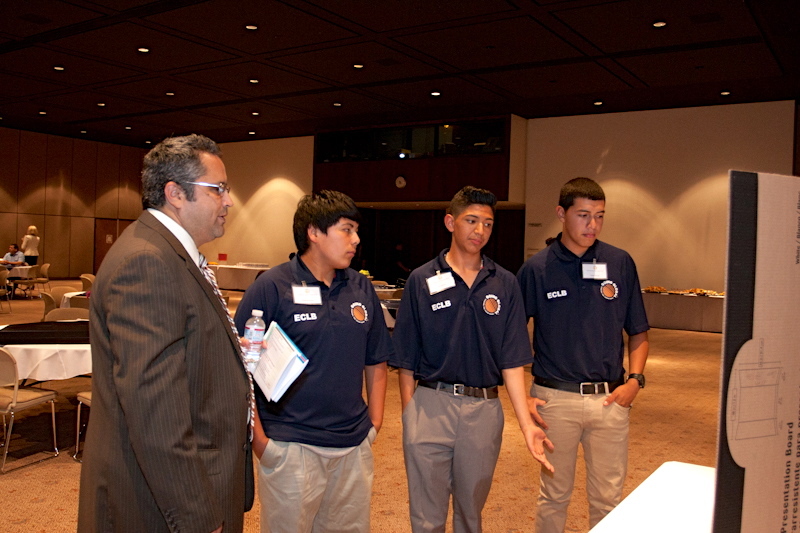 Help Cabrillo High students explore careers in Long Beach and cross another culmination stage. Student dreams can only get bigger and that’s not bad for Long Beach or the support groups that stand behind them. The lovely ECLB ladies from the Colleges & Education group. Good job! We would like to thank all sponsors, supporters, ECLB advisory board members, ITEP staff, volunteers, ECLB students and parents for helping us launch our first after-school program and ECLB culmination ceremony and competition. Special recognition to ECLB Advisory Board Chair, Stacey Jones of CH2M Hill and Event Chair, Jesse Urquidi of P2S Engineering. Thank you all for nurturing the little idea that could. For additional ECLB Culmination photos, visit the ITEP Facebook Page.